A couple other fun things on this month's list include a dedicated Killer Croc collection, strange as that sounds; also some nice 1990s throwbacks with Shadow of the Bat and Deathstroke collections, plus Superman: Panic in the Sky and Legends re-releases. The holy grail for many a trade-waiter, it looks like the once-canceled paperback Starman Omnibus Vol. 3 will finally, finally hit shelves. Maybe we should do a thing where people post pictures of themselves with this volume (of course, now comes the waiting for the rest of the series). The omnibus series collects the issues more straightforwardly than the original trades, but this is essentially the Infernal Devices collection with extras. (The solicitation does not list the Shade miniseries, included in the hardcover Vol. 3, but I imagine that's just a misprint. The solicitations for this book are unfortunately vague on issue specifics, though Gerry Conway's name is mentioned, suggesting Batman #357 (also the first pre-Crisis appearance of Jason Todd) and the like. I realize now this book is likely also meant to tie-in to the new Suicide Squad movie; I'd guess an issue from Brian Azzarello and Eduardo Risso's Broken City will be in here, too. Collects issues #1-12 of Alan Grant's smart, eccentric Batman series. These self-contained stories include art by Norm Breyfogle, Dan Jurgens, and Tim Sale. I'm not entirely familiar with these stories, but notes I've been getting from you all tell me that what was maybe thought to be another Jim Aparo Batman collection has turned into this Alan Brennert collection, with Brave and the Bold team-ups with Starman Ted Knight, Deadman, Creeper, Hawk and Dove, Black Canary, and more. Art is by Aparo, Joe Staton, and Norm Breyfogle. Also included is the Detective Comics #500 story "To Kill a Legend," and Brennert's alt-history one-shot, the first labeled Elseworlds, Batman: Holy Terror. A Titans: Total Chaos collection seems less of a sure thing these days, but I'm glad to see, finally, another solicitation for a collection of Marv Wolfman's Deathstroke, the Terminator. And this is the series at some of its best, as Slade Wilson and Roy Harper try to stop Cheshire and her nuclear bomb in an espionage tale with long-standing (for the time) effects on the DC Universe. A lock, obviously, for Arrow fans of these characters. Admittedly I've lost track of Justice League United a bit, but these issues (which, no spoilers please, but I think they follow from Convergence in some form) are written by Jeff Parker (following Jeff Lemire), with art by Travel Foreman and Paul Pelletier, closing out the series. It's been a while since I've read Legends, but I don't remember the Suicide Squad presence being all that strong (saved, instead, for the tie-ins). But, if you haven't read Legends and don't have a copy, a new collection of DC Comics's first post-Crisis crossover -- by John Ostrander, Len Wein, John Byrne, and Karl Kesel -- is a nice lead-in to the new Ostrander/Suicide Squad collections. Though there was some concern expressed in the comments of my Prez review whether this miniseries was continuing or not, this collection of seemingly every other appearance of the Prez character ever would suggest DC still has faith in the property. Included is the 1973 Joe Simon/Jerry Grandenetti miniseries, the Cancelled Comic Cavalcade issue, Supergirl #10, Sandman #54, Vertigo Visions: Prez, and pages from Batman: The Dark Knight Strikes Again and Multiversity Guidebook. Collects the first two original 52 trades in one larger paperback (issues #1-26), which is a bigger chunk than before but not quite the hardcover omnibus. The six issue miniseries plus the story from Convergence: Harley Quinn. I have liked what little I've read of Hitman but I can't say this held much interest for me. Was I wrong? Collects issues #13-26, the final issues of Batman and Robin Eternal. Interesting, but perhaps more welcome, that this was half the size of Batman Eternal. Quality of DC's weekly series have varied, but I'll be curious to see if twice-monthly instead of weekly turns out better. Collects Detective Comics #41-47 and the preview story from Convergence: Justice League of America. This finishes out Brian Buccellato and Francis Manapul's (writing) run before Peter Tomasi comes on, including apparently the "Robin War" crossover issue by Ray Fawkes. *Star Wars Vol. 1 and Star Wars: Darth Vader Vol. 1 HCs—These are a good value if you’re behind on reading Marvel’s “Star Wars” (as I am). “Darth Vader” is the one I’m more excited for since I’ve heard rave reviews of Kieron Gillen’s work. *Deadpool Minibus 2 HC—The first Minibus is also being reprinted to accompany this book, which collects several one-off Deadpool miniseries. I’ve already reviewed “Hawkeye vs. Deadpool” and “Deadpool vs. X-Force”, and it’s joined by Peter David’s “Deadpool’s Art of War” (which fell flat for me). Like the first Minibus, it also rounds up two more Cullen Bunn stories: “Night of the Living Deadpool”, which like most of his stories I’m not that interested in, and “Deadpool’s Secret Wars”, which is on my list of upcoming reviews and is supposed to be great. *Hercules: Still Going Strong TPB—This is a series I read month to month, partially because it includes Gilgamesh, my favorite little-known 80s Avenger recruit that isn’t Stingray. There’s a lot of interesting reinvention of Hercules here without any major retcons. *Squirrel Girl Vol. 3: Squirrel, You Really Got Me Now TPB—Technically the first trade of the restarted series, but it’s not like that really matters since the title went on as usual despite the reboot. This is notable for a crossover with “Howard the Duck”. I’ll get to both of these titles in the near future. *Squadron Supreme Vol. 1: By Any Means Necessary TPB—The team finally has a purpose other than being Marvel’s stand-ins for the Justice League, meting out vengeance throughout the alternate worlds. Plus, with James Robinson, Leonard Kirk and Alex Ross on art duties, it’s a mini “JSA” reunion. *Moon Girl and Devil Dinosaur Vol. 1: BFF TPB—Marvel struck gold once with a young woman-of-color Inhuman, and they’re looking to follow Ms. Marvel’s success with this title. I don’t know if it’s succeeded in regards to sales, but the book is really well-done and does a lot with its rather unusual premise. *Black Knight: The Fall of Dane Whitman TPB—Why isn’t there a volume number? It’s because this was the first ANAD Marvel Now! title to get cancelled. Marvel put a little too much faith in the popularity of Weirdworld to drive sales for this but didn’t realize that Frank Tieri isn’t beloved by many fans. *Patsy Walker, a.k.a. Hellcat Vol. 1: Hooked on a Feline TPB—Apart from Jess being Luke Cage’s wife in “Power Man and Iron Fist”, this is the best title to look for if you enjoyed the “Jessica Jones” Netflix series. You haven’t lived until you’ve seen Brittney L. Williams draw the most adorable version of Daimon Hellstrom ever conceived. *Deadpool: World’s Greatest Vol. 2 TPB—Like the “Wedding of Deadpool” trade, this has an odd make-up, consisting of an inventory issue taking place in the future, a mammoth anniversary issue and the introduction of Masacre, the Mexican Deadpool, in an all-Spanish issue. May also sees reprinting of Masacre’s first appearance, this time done with the dialogue run through a couple of Internet translation sites, and it would be nice to get that translation in this trade too. *The Chronicles of Conan Vol. 32: The Second Coming of Shuma-Gorath and Other Stories: I’ve never read Marvel’s “Conan” books, but this one had me at Shuma-Gorath and it’s by the king of those comics, Roy Thomas. *The Steam Man TPB—Finally, a comic about Wild West giant steampunk robots comes along that might actually redeem “Wild Wild West”. It’s also co-written by Joe R. Lansdale, who wrote “Bubba Hotep” and the BTAS episode “Perchance to Dream”, possibly the best Scarecrow story of all time. *Transformers MTMTE Vol. 9 TPB—They goofed in the solicit, giving the one for “Adjectiveless Transformers” instead. There’s a central theme of creepiness between the manipulations of Getaway and a telepathic serial killer. *Mythic TP—Phil Hester and John McCrea… I probably don’t have to say anything else, but the book also happens to sound like a mythology-focused version of “Planetary”. *Plutona TP—This book from Jeff Lemire seems to take some cues from “Stand By Me” but with a superhero corpse. It certainly seems intriguing. I remember as a kid, reading Brave and Bold, that those Alan Brennert stories were pretty far above the usual Bob Haney wacky stuff. Time may be fogging my memory, but they were definitely rather sophisticated for the time, and that story from Detective #500 was particularly good. I'll be picking this up for sure. I don't know what to think about Rebirth. I really enjoyed the New 52 at first, but there seemed to be a marked decline in quality over time. I'm still picking up some of those New 52 trades I didn't get when they first came out, but I'm hoping that Rebirth results in some really good stories coming from DC. I think a lot of the DCYou titles were pretty good, but so many fans have been put off by DC in the last few years, there just wasn't the marketplace for anything experimental by DC. How books like Omega Men and Midnighter didn't find an audience is beyond me, as they were much better than any new titles out of DC in a while. What concerns me too is how quickly Rebirth follows on the heels of DC You, suggesting that the intentions of DC You (which I thought were good) didn't catch on. I don't think anyone wants to see what a Bizarro-DC You, tone-wise, would look like. I guess there's a mini-Rebirth about once a year -- see the New 52 "waves". But DC You felt like a relaunch, and for it to be followed immediately by a Rebirth relaunch begins to feel like there's trouble underfoot. Does the new Panic in the Sky edition have issues that were not previously collected? I have the old TPB, and need to know if i should upgrade. None of the solicitations suggest new issues to me. I'd never complain about collecting more issues from that era, but I'm not entirely sure what that's really relevant they could add to that trade other than just general Triangle Title material (the universe cries out for a Triangle Title omnibus). You know, of course, that the Panic in the Sky trade itself includes a (minor) deleted scene from that story at the end. Yes, it does have issues not previously collected, mentioned right there in the solicitations. The original trade is 188 pages and the new solicitation is 296 pages. I will also add I am unsure about "upgrading" because I like that the original trade has a lengthy 3 page introduction by Roger Stern and a 4 page afterword by Mike Carlin, and I find this material fascinating and DC keeps leaving this stuff out when they do reprints. And Adventures of Superman #489 was only partially reprinted in the old trade. Hopefully more Superman from era will follow. And it's Action Comics #674-676 (they still didn't fix that mistake), with #676 being the one that wasn't collected before. Well, I'll be curious to hear if there is new material after all. What's the significance of that Action Comics #676, do you think? More Supergirl material vis a vis her meeting with Lex Luthor II? That issue is in They Saved Luthor's Brain, though that collection's pretty well out of print, I think. The significance of Action Comics #676 is that it is the next Superman issue after Adventures Of Superman #489. Then the next three are Man Of Steel #11, Superman #67 and Adventures #490 that are also in the book. Alternatively, Superman #66 is where Panic in the Sky ends, and Adventures #489 is an epilogue but after 8 or so pages the issue moves towards new plots (thus old trade has only the beginning of the issue and one new page to give the story more definitive conclusion) that apparently go for a few issues and I've been told Adventures #490 is a good break. 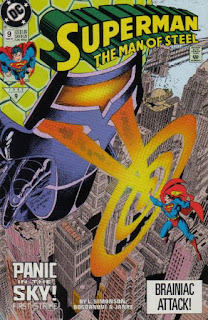 Also, I think Superman #67 follows on that metal orb from #66 that Brainiac released as he was losing. Whichever, what's important is that instead of having an incomplete Adventures #489 we have all of it and instead of 8 consecutive Superman issues we have 12 consecutive Superman issues. There's nothing to complain about here I think. Likewise, in the event that DC collects Superman: Blackout and in addition to the 5 issues of Blackout proper they decide to add next 8 issues to bring it to the size they tend to release their collections in, I'll be happy that I have half year of early 90s Superman collected. I wonder if that all-new epilogue page from the old TPB will be in this newer, bigger edition along with the additional issues. Thanks Jordan! Ordering it now. And i see your point about not selling it due to the intro and forward. I kept my older copy of Death in the Family for the exact same reason. So i have D-Family in trade twice. @Marek, I'd never complain about more Triangle Titles being collected (and my god it's good to be somewhere that people know "Blackout"). Another result of collecting that metal orb issue is maybe it'll help put to rest the long-standing misunderstanding that the orb had something to do with Doomsday, as was the confusion for a while. Amazon has a listing for Titans Total Choas coming out on May 17, is that no longer happening? I'm unsure. There was an initial listing that got pulled, and then this new one came along. I'm hopeful that the new one will stick, I'm just not 100% confident. If it was still happening it would be solicited last month with other collections for May. At this point best case it's delayed, but Amazon doesn't know that yet. Small correction - Batman and Robin Eternal is still weekly, but it's 26 weeks instead of 52. It's tighter, and I believe the writers had more mapped out in advance (there certainly aren't as many meandering plot threads, about which I have my own thoughts). Although I see Doug list the Marvel Solicitations in the comments, I would really like that Marvel have a separated dedicated article with short descriptions as DC have. When was the last time a new Absolute edition was solicited? Actually, I just found "Absolute Batman Year One" listed on Amazon. And while that is technically "new," I would much rather see something by someone else other than Frank Miller (or Jim Lee) get an Absolute treatment. Hello. Just wondering if you know if DC will keep on going with their New Teen Titans Softcover Paperback Collection after volume 4, or if for the following numbers of the collection I should just buy the Terra Icognito and Judas Contract Paperbacks from asome years ago... Thanks! Yes, a New Teen Titans Vol. 5 paperback has been solicited. It will still be a while before they get to collecting new material, if the paperback series lasts that long. Justice League United Vols 1 & 2 were released in hardcover. Vol 1 was released in paperback when Vol 2 was released in hardcover last December. However, Vol 3 seems to be paperback only. Will Vol 2 also be released in paperback at around the same time? I don't see a paperback Vol 2 listed on Amazon. It would be strange if Vol 1 was available in both, Vol 2 in hardcover only, and Vol 3 paperback only. This would be strange but not wholly surprising. JLU is a title that just petered out, I think; I don't think, in shutting things down for "Rebirth," it turned out to be that important or sell that well. In that instance, it's not surprising if they don't bother to release another version of Vol. 2, or to release Vol. 3 just in paperback.